I just hired an electrician to add electrical outlets to our older house. 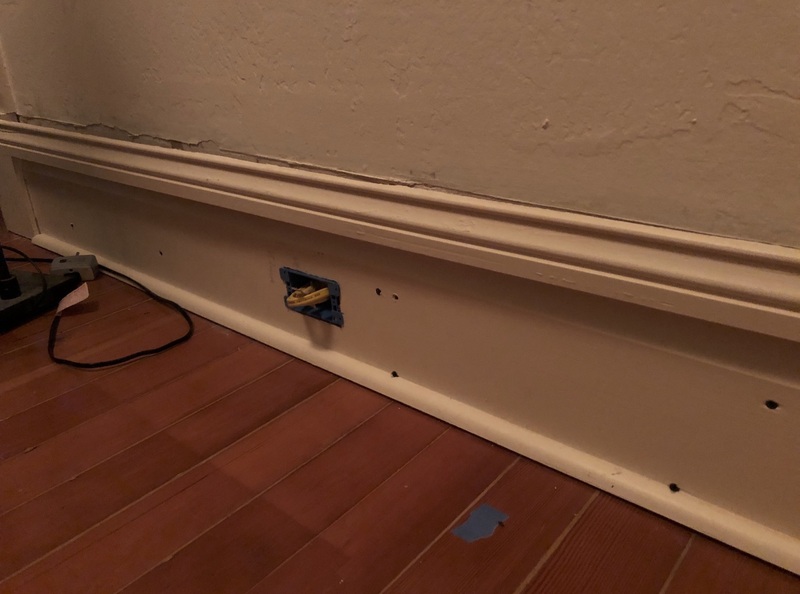 We decided to add our outlets to the base moulding because our house is an older lath and plaster construction. When the electrician reattached the base moulding, he appeared to use screws to attach the base moulding vs. using nails. Not only that, he appeared to damage the quarter round moulding in the process. See attached picture. Is this normal? Or did my electrician really mess up? Thanks in advance for any experience and insights that people can provide! Your electrician is not a finish carpenter. Nobody competent would screw base like that. All is not lost, however. Just make sure the screw heads are sunk below the surface of the wood. Get some wood filler/spackle (anything will do). Sand flat. Refill if you have divots. Prime. Paint. It looks like the cap on the base was either attached badly or not attached at all. Do it over to match the line it had before. Caulk that gap before paint and it'll all be fine. How to I repair moulding damaged by Blue Scotch tape? Should I remove moulding before adding a plaster ceiling?